At less than 3cm thick and with a carbon-fiber case, the TZ50B looks smart enough for such an important birthday party and has plenty of useful technology in its 1.2kg frame. For starters, the 1-seg digital terrestrial TV tuner that features in almost every new Japanese gadget is included, as is an antenna that slides out of the screen surround. Then there’s a FeliCa IC-card reader that can read the e-money and e-credit card chips found in many phones. 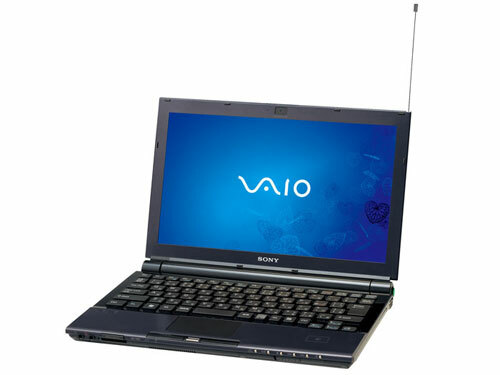 Otherwise, a 1.2GHz Celeron M 442 processor is joined by 1GB of RAM, an 80GB HDD, a dual-layer DVD writer, a built-in 0.3-megapixel webcam, a fingerprint reader, an 11.1-inch 1366 x 768-pixel widescreen, Wi-Fi, Bluetooth, Office Personal 2007 and Windows Vista Home Premium. Interfaces include USB 2.0, FireWire and ExpressCard 34, SD and Memory Stick slots. The Celeron CPU allows the battery to stretch to around eight hours, while there are options to add a 32GB solid-state disk and to replace the DVD drive with a 160GB hard drive instead and to upgrade to a Core 2 Duo processor.